Christmas his year was special. Special because we spent that time together. 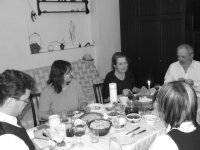 First, double Christmas Eve Supper - with Hanka's family and then with mine, in Nietkowice. We turned out to have been good this year cause we found lots of presents under Christmas tree. Later we were just going from one house to another, eating and doing nothing.